I never really had the grandparent experience. My mom’s parents both died in a car accident long before I was born and while I knew my dad’s parents, they were much older and my grandma had Alzheimer’s for most of the time I knew her. But I did have the most fantastic next-door neighbor. Her name was Mrs. Miner and she used to let me hang out at her house and talk her ear off and she would make me grilled cheese sandwiches. This might not sound like a big deal, but my mom made “grilled cheese sandwiches” in the microwave (my mom was a lot of things, but a grilled-cheese-sandwich-maker she was not.) And later, after my mom died, my step-mom made them in the oven. Those are not acceptable alternatives. 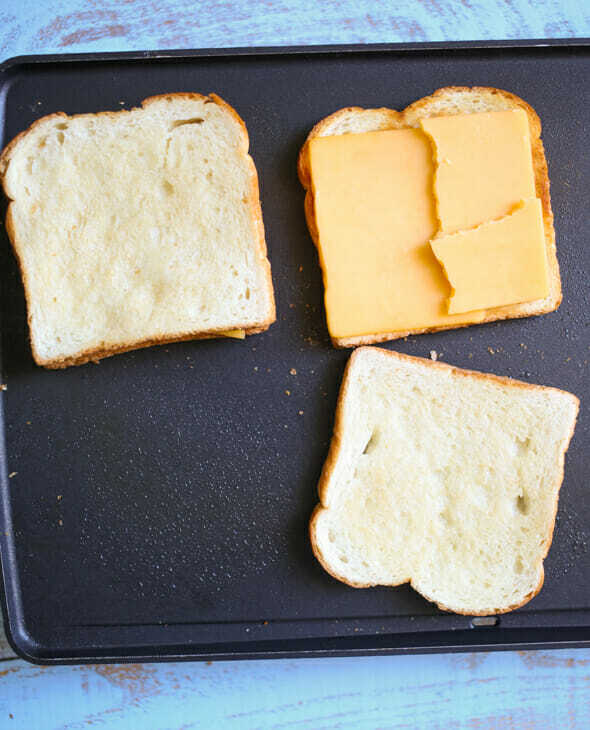 Grilled cheese sandwiches are made in a pan. With butter. Is it something you should eat every day? No. Is it something you should eat sometimes? Yes. But only if it’s made in a pan. With butter. I didn’t think knowing how to make grilled cheese sandwiches was that big of a deal until recently, I went to a sandwich chain and got their grown-up grilled cheese and it wasn’t right. And I thought maybe it was a fluke, so I ordered it another time and it was still not right. And then I went to a local restaurant that specialized in fancy grilled cheese–all sorts of cheese, caramelized onions, figs and jams and cured meats and pepper jellies. And I thought surely they would get it right, this restaurant that specialized in grilled cheese. It was still not right. Too greasy, cheese not melted in the middle, bread not toasted right. Now, lest you all think I’m a giant food snob who is unbearably picky, I am really not. I’m usually more than happy to let someone else do the cooking. But. 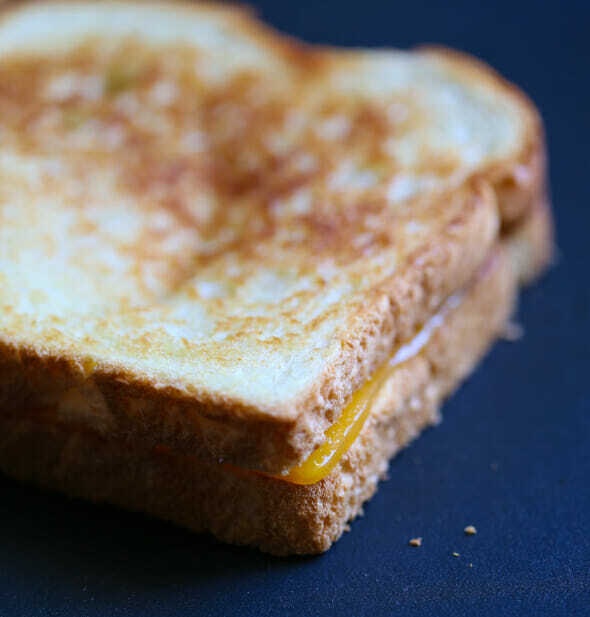 When it comes to grilled cheese, this is a life skill everyone should have, like tying your shoes or riding your bike or knowing how to swim or watching an entire season of a TV show on Netflix in a 24-hour period. If my kids leave the house knowing how to properly make the perfect grilled cheese sandwich, I’ll mark that in the “win” column. For each sandwich, you’ll need two slices of bread, about 1 1/2 ounces of cheese (more or less depending on your taste and how indulgent this experience is going to be) and about 2-3 teaspoons of butter. Let’s talk for a second about the bread. There is a time and a place for fancy ciabattas and focaccias and whole grain breads with nuts and seeds. In my opinion, when it comes to straight-up traditional grilled cheese, you’ve got two options: sliced white and sliced white sourdough. 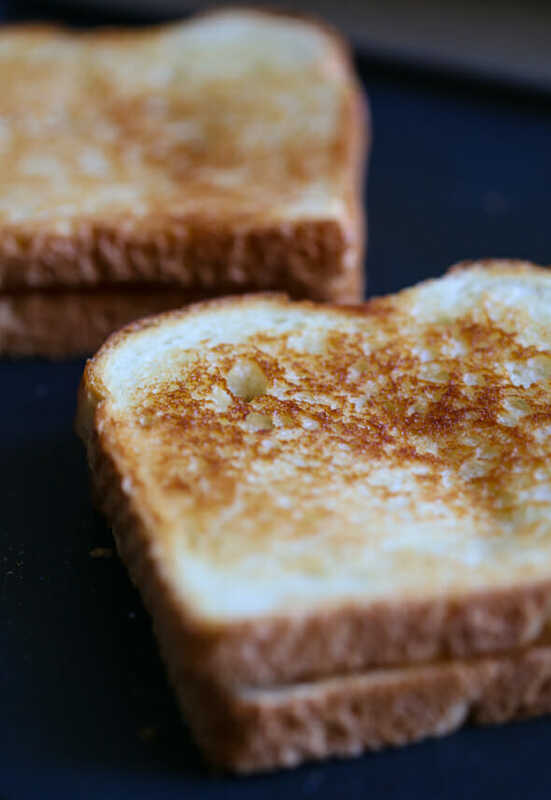 If you’re feeling adventurous, you can venture into Texas Toast territory, which is more of an advanced grilled cheese situation because enough heat has to get through the thick bread to adequately melt the cheese without burning the bread. We’ll discuss that more in a minute. And then the cheese. Some cheeses are meltier than others. The “sharper” the cheese, the tricker it is to melt it, so when it comes to grilled cheese, I tend to stick to the milder cheeses: mild or medium cheddar, Colby Jack, pepper jack, Havarti, mozzarella, American (the good stuff from behind the deli counter, not the uber-processed cellophane-wrapped single slices). I haven’t had great luck with Swiss, but if you do use it, it pays to spend a little more. Also, I don’t recommend using pre-shredded or pre-sliced cheese (especially the shreds)–they’re often coated in a non-stick powder that makes them melt in less-than-desirable ways. The next big thing is heat. You want to cook your grilled cheese on the low side. I like to keep things around medium on the stovetop or 300 degrees F if I’m using an electric skillet. Basically, it needs to be hot enough to melt the cheese and create a nice, toasty exterior without being so hot that it burns the bread (while leaving the cheese un-melted). If it’s not hot enough, the butter will melt and the bread will get soggy and the cheese will half-heartedly melt and then solidify. And no one wants that. Cookware. While I have a lot of opinions on all things grilled cheese, I don’t actually have a preference on what kind of pan to use; cast iron is always a great choice and you don’t have to worry about sticking. Stainless steel might cause some sticking if you’re not careful, but it will also help create a crispier crust. I usually just grab a non-stick pan or use my non-stick electric skillet because they’re easily accessible and we always wind up with delightful results. Ready to get started? Heat a skillet or griddle to medium heat (about 300 degrees if you’re using an electric skillet.) Butter one side of each slice of bread. There’s some discussion about toasting both sides of the bread (like buttering both sides, toasting one side, flipping the bread, placing the cheese on the toasted side, yada yada yada)–some people swear by it–but I tried it and it all felt too greasy and it didn’t taste different enough to make it worth the effort or the extra calories. HOWEVER. I think this would be a good method if you’re using a thick bread like Texas Toast. then top with another slice of bread, butter-side up. the butter is smelling caramel-y, and the bread on the skillet side is golden brown. Using a pancake turner or spatula, carefully flip the sandwich. Cook for another 2-3 minutes or until the bread is golden brown and the cheese is completely melted (the cheese around the edges will look dark and oily right before it’s ready, then it will suddenly turn very light when it’s ready. Also, if you pick up the top piece of bread, you’ll be able to feel that the cheese is melted through and holding the sandwich together. Cut each sandwich in half diagonally and you should probably serve it with creamy tomato or roasted red pepper soup. This creamy tomato soup and this roasted sweet corn and tomato soup are both fantastic options, and we also have a roasted red pepper and tomato soup in our latest cookbook that is one of my FAVORITES. If the ooey-gooey perfection of amazing grilled cheese sandwiches has always eluded you, this tutorial is for you! 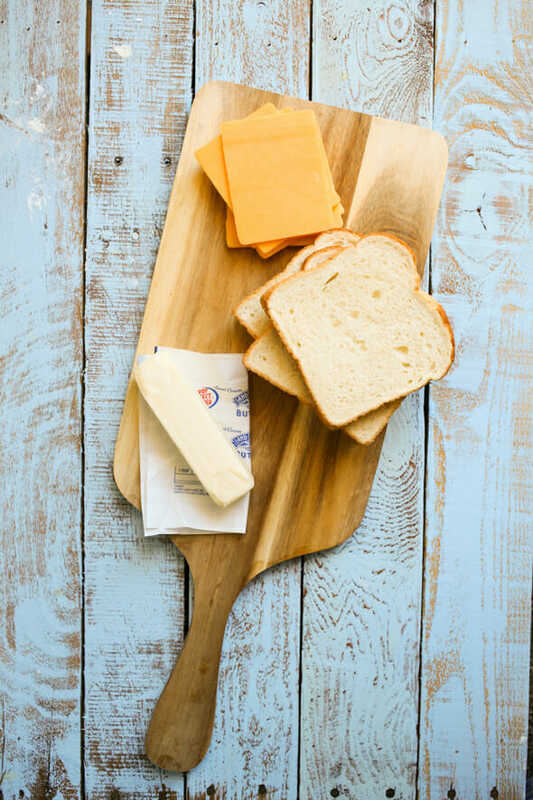 Cheese of your choice, preferably NOT pre-sliced unless using American cheese; good choices include medium or mild cheddar, colby jack, pepper jack, American (the good-quality stuff from the deli counter at the grocery store), Havarti, and mozzarella. Good quality Swiss will melt, but sometimes this can be hit or miss–spend a little more for the good stuff. Heat a skillet or griddle to medium heat (about 300 degrees if you’re using an electric skillet.) Butter one side of each slice of bread. * Place the cheese evenly on top of one un-buttered side, then top with another slice of bread, butter-side up. When the skillet is hot, carefully place each sandwich on the skillet. Cook until the cheese is starting to get melty, the butter is smelling caramel-y, and the bread on the skillet side is golden brown. Using a pancake turner or spatula, carefully flip the sandwich. Cook for another 2-3 minutes or until the bread is golden brown and the cheese is completely melted (the cheese around the edges will look dark and oily right before it’s ready, then it will suddenly turn very light when it’s ready; also, if you pick up the top piece of bread, you’ll be able to feel that the cheese is melted through and holding the sandwich together. Cut each sandwich in half diagonally and you should probably serve it with creamy tomato or roasted red pepper soup. *If you’re using thick sliced bread, butter both sides of the bread. Toast one side of both slices, flip one side over, and while the other side is toasting, add the cheese and top with the other slice of bread, toasted side facing the cheese, then flip when ready. If you don’t have any soft butter ready, you can take a stick of cold butter and rub it generously into the hot pan before adding then bread, then again as you flip the sandwiches. If you want to add things in, these are a few of my favorites. If you’re using something big or substantial like lunch meat or tomato slices, put a slice of bread on each side to hold the sandwich together. Figs on a grilled cheese? There are no words. But yes! White bread, regular cheese, butter. Yay for me having a valuable life skill….I make a mean grilled cheese! And I totally prefer processed American cheese slices in the cellophane wrappers. Ha! YES for processed cheese food!! YES. Sadly, she doesn’t come to Louisiana. The closest I’ve found is Nature’s Own Butterbread, but really, it doesn’t even come close. I moved to Texas from Idaho last year and I just cannot find good bread here! I buy the Nature’s Own Butterbread, but it’s not great. Yes, we do need good bread here in the south. I made one with that bread for my kid’s lunch today! With Muenster cheese. Yes. Yes. Good work. But what’s your take on mayo? I recently saw a buzzfeed tutorial on adding mayo to the OUTSIDE of the bread. I tried it and it toasted up so perfectly and never threatened to burn. And it was tasty! Also, my panini maker is a grilled cheese maker. I’ve tried it and I liked it okay, but I missed the caramelly goodness of the browned butter. I think I’m in the traditionalist camp here. I’m in the more is better camp…I soften the butter and mix it with mayo. I get the buttery flavor and the brown toastiness of the mayo. On the mayo question, I’ve done some experimenting, and my favorite is a thin smear of mayo on the inside (not toasted) and butter on the outside. Having both the butter and the mayo flavors together is the best of both worlds, it’s delicious. Also, I love using a good crusty French bread and slicing it very thin. But I think French bread is superior to any other bread always. Also, I have to give a plug for pickled jalapenos as a fantastic add-in if you like a little kick. When I first head about mayo, I was skeptical, but I love the way it toasts bread and that it is always perfectly spreadable. I won’t go back to butter! Maybe I’ll try the half butter half mayo….nope, too much work. You should try The Melt restaurant in Cleveland, OH. The most amazing grilled cheese cooked to perfection! My other favorite is the Normandie Cafe in Holladay, UT; another fantastic grilled cheese option. Thank you for sharing this tutorial! And grilled cheese in the microwave? You poor dear. Ooooh, good to know!!! And now I’m craving Cabot’s extra sharp white cheddar, lol! Your way is the way I make grilled cheese. I only learned as an adult. My mom was an in the oven with velveeta maker (ew! ), which is why I was convinced I didn’t like grilled cheese sandwiches. I like the butter both sides of the bread and toast method, but I only super lightly butter the extra side of bread to toast it/warm it up to melt the cheese. And YES to the Cabot extra sharp white cheddar grated. Hubby and I get this cheese, while the kids prefer the American or regular cheddar options. 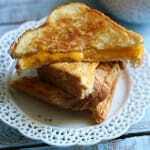 I love grilled cheese sandwiches or toasted cheese as we called it in our house. Whenever mom was feeling under the weather and dad cooked, he would make toasted cheese sandwiches with sausage. However, we were not a white bread house so we just stuck with our usual store brand sandwich wheat or the occasion rye bread. Delicious! And…another Kraft Singles fan here. Ha! This is how I always make them too, and they turned out great! Try adding a sprinkle of garlic powder. It is amazing! I don’t know you, but I think we’d be friends. Garlic everything! Haha, grilled cheese in the microwave! We TOTALLY used to do that. I don’t think my mom did, but us kids did. I can still taste it and it really isn’t at all pleasant. Soggy bread that starts to get tough from being microwaved is just not good in any way!!!!! We also used to melt chunks of cheese in the microwave and eat it plain. While I love cheese, that is just kind of disgusting. We’d always get in trouble for doing it because cheese is expensive! This is pretty much how I do grilled cheese too! I think the temp is the trickiest part-the whole not burning the outside but hot enough to melt the cheese thing. Ohmygosh, I totally used to eat the delicacy known as “cheese on a plate.” My oldest sister came home from college and was thoroughly disgusted, hahaha! Another blogger I followed suggested melting butter in the pan and shredding your cheese first. Tried it, came out with a soggy, greasy mess. Shredding the cheese was pretty genius, though. All that said, I will say that Whataburger has one fine grilled cheese sandwich. Texas Toast for the win!! Wow! I have six kids from ages 4 to 15 and I don’t think I’ve ever made grilled cheese for them. How have I missed that? It may have something to do with memories of grilled cheese with the burned parts scraped off, which is pretty much how my mom used to do it (which is funny because she is a great cook!). My kids have Fall break next week and I think we better bust out the electric griddle and see if 300 degrees and a little patience will yield better results than I remember as a kid. My husband’s family calls grilled cheese sandwiches just “cheese sandwiches.” I started to get self conscious thinking that I was in the minority calling them Grilled Cheese. Now I know that in fact his family is in the minority. I love reading your posts, Kate! This is going to sound strange, but if I knew you in real life I know we could be friends! For my little brother grilled cheese was a food group when he was a kid (he is all grown up now and it might still be! Ha!). 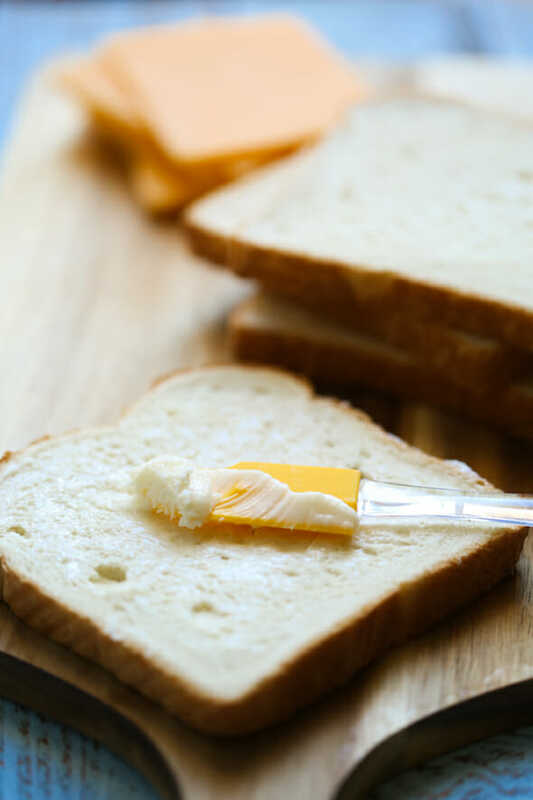 Grilled cheese is one of my favorites and one of my specialties, however I use mayonnaise instead of butter and the result is amazing, I dare you to try it! When I was little we went on vacation, and my dad got so mad, because I would order a grilled cheese sandwich everywhere we stopped. One night he made me order something else, and I took two bites and my brother’s finished it off, lol. 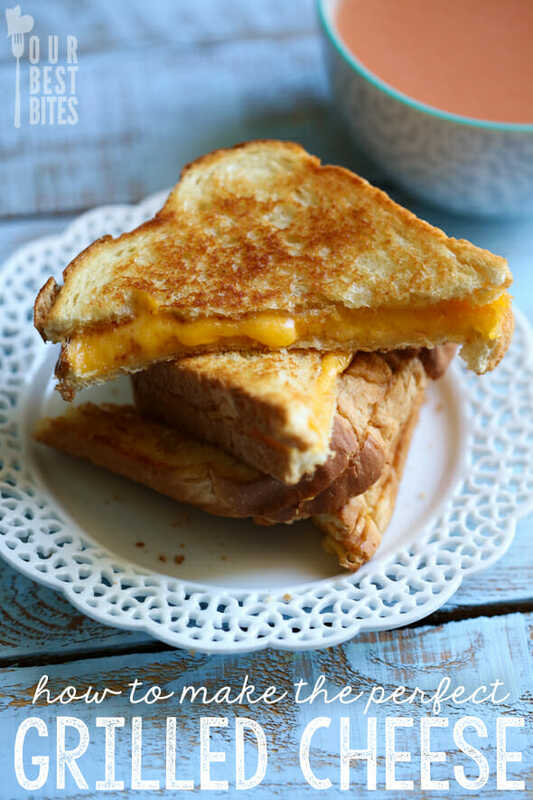 Grilled cheese is still one of my favorite foods, and one of the reasons I don’t keep my butter in the refrigerator. Recently I just discovered a local cafe that makes a great grilled cheese with arugula and bacon. It’s amazing! Grilled cheese in the microwave? Or in the oven?? Eeek! I have always made grilled cheese this way (didn’t know there was any other way) and I love it. I do prefer it with the cellophane wrapped cheese though (sorry) although Gouda is my other favorite as it melts smooth, too. I like mine with a side of mayo to dip in and my kids have learned to love the same. Exactly how my mother taught me…and I’ve taught my kids – Old School…Perfect! I can’t believe I just read a post about how to make grilled cheese. That just goes to prove I love you guys so much I’ll read anything you publish. Lol. I just introduced grilled cheese sandwiches to my 13-month old son last week. He couldn’t stop eating it. Quick, easy, and delicious. I LOVE me some grilled cheese. In college, I used to eat it for breakfast all the time! I’ve found the secret to getting that golden brown toast is to wait until the butter on the top side of the sandwich is melting. Once at least half of the butter is melting into the bread, it’s ready to flip. Then the second side doesn’t take long to brown up! This is exactly how I make mine! Perfect solution for our overcast, cool, rainy day complete with thunder? Thanks! I love slices of avocado in my grilled cheese, with a thin layer of cheese on either sideof the avocado. And I love grilled cheese on homemade whole wheat bread. White bread, always! If you are lucky enough to find a good dense pullman loaf you may reach grilled cheese nirvana. Nothing is better than bare naked grilled cheese. Tomatoes and bacon etc are for toasted cheese sandwiches with aged cheddar -another, albeit delicious, animal entirely. I put the non buttered side of the bread in the pan to warm it before placing the cheese on. It helps the cheese start melting into deliciousness. I too for an everyday grilled cheese, prefer the Kraft Singles!!! I have made them with artisan thin sliced bread—an English toasting bread—and deli cheeses, with a homemade tomato bisque soup for my inlaws—SCORE!!!! But without a doubt, the frypan, butter, and crispy on the outside, ooey gooey on the inside!!!! I have been adding honey to my grilled cheese FOR YEARS!!! However, I must admit my recent favorite bread is Panera’s Tomato. Sounds odd but, it’s made with a sweet crumble that marries well WITH EVERYTHING ?? Thank-You for pricing that I’m not the ONLY Grilled Cheese w/Honey Connoisseur on the planet!! ?✊???✊??? Tis Marvelous to find a Kindred Palate!!!!! I love making grilled cheese sandwiches in my belgian waffle iron. It cooks the bread perfectly and you don’t have to worry about burning, the cheese melts just right, and it’s super easy clean up. Plus, it makes it really easy to cut it into toddler size bites. I also put a little bit of mayo on my grilled cheese sandwiches. I am not a big mayo person, but it has to be on the grilled cheese; it makes all the difference in the world! I used to be very particular about my grilled cheese sandwiches when I was a kid (I’ve loosened up a bit over the years). If I was using American cheese, the bread had to be white and I would dip it in applesauce. If it was cheddar cheese, it would be on wheat bread with mustard and pickle slices inside. Mmmm, now I’m craving one!! I love that you mentioned Mrs. Miner in this post … She was the perfect ‘Grandma’ I always loved her too!! Also love this grilled cheese post!! I’m going to make them right now !! 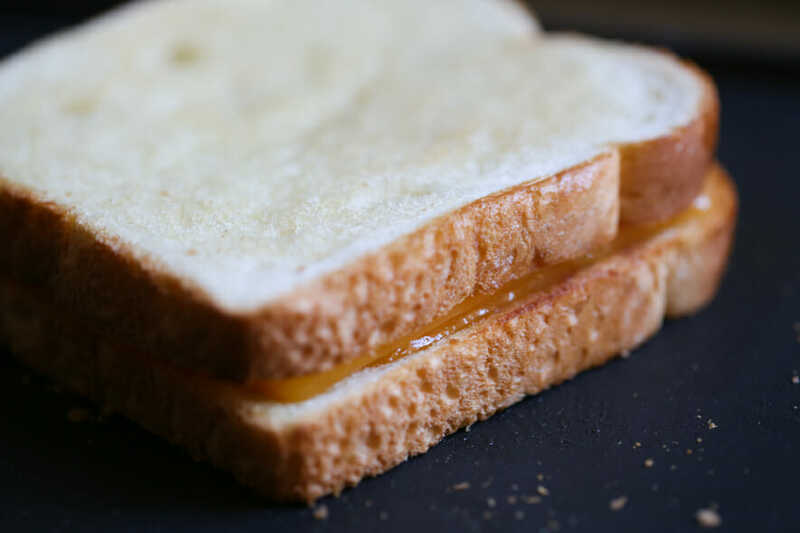 Try spreading a little grape jelly or homemade jam on your grilled cheese with each bite. It’s to die for…. I always melt the butter in the pan before I drop the bread on it. That’s how my dad did it, that’s how I do it. It coats the bread perfectly without having to wait for the butter to soften. I use American cheese, but the good stuff that’s actually labeled as cheese, and not cheese food. I swear by this method because it’s perfect every time! roasted hatch green chiles (diced) are amazing on grilled cheese! Um, this sounds kind of amazing. I’m totally doing this next time I do grilled cheese! I know this sounds crazy, but homemade raspberry jam (Because there in nothing better than homemade) on a grilled cheese is BEYOND amazing!! Everyone we convince to try it loves it! Hmmmm….I’m thinking that some homemade hot pepper jelly would also be FANTASTIC on a grilled cheese. I’m going home to do that. right. now. The cafeteria at the hospital were I work makes me grilled cheese on sourdough with pickle and tomato slices when I am pregnant and they are delicious! This post was hilarious at the start! I agree that it is a life skill! I’ve been experimenting making a more grown up grilled cheese. The first time, I shredded the cheese myself and put it on the inside AND outside of the bread. It was very tasty. My very first job was at Sizzler and they have this wonderful cheese toast. So that’s what I tried the second time. Basically butter and Parmesan on the outside with shredded inside. Then I decided to get wild and crazy and try it with your garlic bread seasoning instead of plain Parmesan. Yummy! Reminded me of something out of an Italian restaurant. I had no clue that there was other ways to make a grilled cheese other than on the stovetop (or perhaps a fancy panni maker) Microwave, really? I usually use butter, but occasionally I’ll use spiced mayo. Spiced is take your favorite mayo and blend in a few spices, I like cajun, put in a small jar. It should sit in the fridge a few hours, preferably overnight to let the flavors do their thing.. I also use it to toast hamburg buns too.